White Choco-Eclairs with Danerolles - fingerlicking good! The eclair originates from the 18th century and was most likely created by cook Marie-Antoine Carême (give the man a statue). The pastry is elongated, has a soft filling and a chocolate or glaze layer. They are just AMAZING. 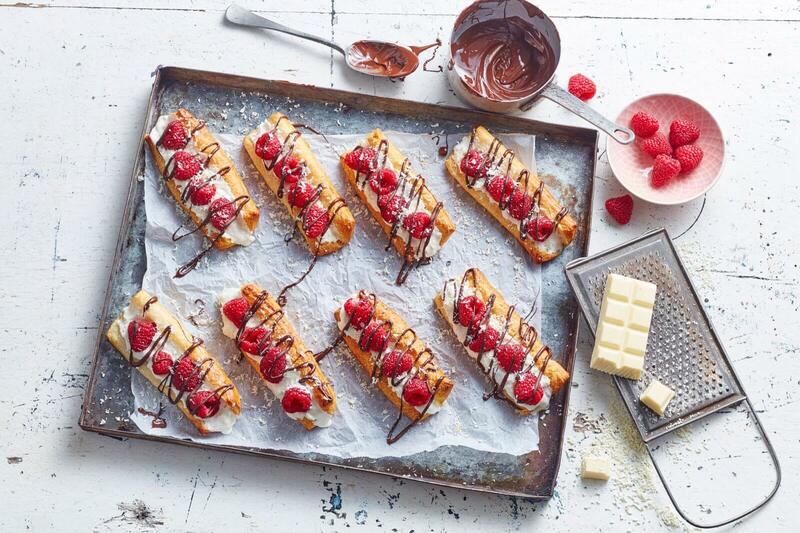 Feeling like a fancy treat, try our White Choco- Eclairs with white chocolate and raspberry! Roll out the dough and cut the dotted lines. Fold the eight dough patches double and lay them on a baking sheet coated baking sheet. Cloth the egg and coat the dough with egg yolk. Bake the dough at 180 degrees for 8-10 minutes. Let the dough cool down on a grid. In the meantime, beat the cream and add the sugar at the last minute. Make sure it is mixed properly. Melt the chunks of chocolate into a saucepan on low heat or in the microwave by stirring passionately until the chocolate has melted. Cut the dough across the length, but make sure you do not cut the dough completely. Create an opening. Fill the eclair pastry with whipped cream and fresh raspberries, by pouring it in the opening of the pastry. Spread the white chocolate over the eclairs.